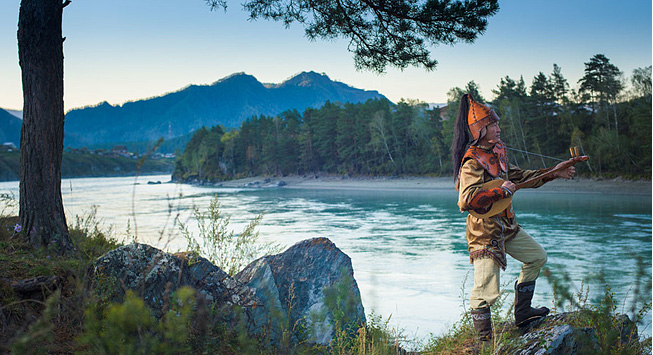 Learn about the life of a kaichi, a legendary group of storytellers in Altai. There is a legend in the Altai: if a storyteller carves a musical instrument from lightning-struck cedar, then it will have a soul of its own. To find such a tree in the thick taiga forest, however, one needs to have a special relationship with the spirits. "I wasn't looking for this tree," he said. "It was the cedar that found me." It appears that Altai's spirits have kept a close eye on Kergilov throughout his life. He was born in a remote Altai village and spent his childhood helping his parents tend livestock. In his free time he read as much as he could. "Most of all I liked Altai legends,” Kergilov says. “After I read one, I would wander around the mountains, imagining I was the hero of those tales, riding on horseback with a bow and a sword." Had this happened a hundred years earlier, Kergilov would have learned about great warriors and their feats not from books, but from a kaichi – a travelling storyteller. In the times when there were no newspapers, no radio, no theatres and no internet, these itinerant storyteller bards would roam the mountains, from one nomadic camp to another, telling highlanders legends called kai. Shepherds would gather around the fire each evening and listen to the kaichi's stories until late into the night. The next day, the kaichi would continue on his way. With their sonorous voices, singing accompanied by a two-string ‘topshur’, they were guides to the world of the heroes and spirits of Altai. However, when the Soviet government took control of the region in the 1920s, ‘kaichi’ storytellers were repressed, along with shamans. With time they became legends themselves, just like the mighty protagonists of their stories. The Altai still remembers them. Through collective memories, the legends made their way into books; these books fell into Kergilov’s hands when he was young. Imagining himself the hero of such an epic poem, he never expected to become a guide to the world of legends quite so soon. First, he learnt eastern martial arts and a traditional Altai wrestling style called ‘kuresh’. Later he mastered various traditional arts and crafts, including woodcarving. It was at this point that Kergilov started making ‘topshurs;’ folk string instruments native to the region. One of the first instruments he crafted was intended for a friend of his. The friend asked Kergilov to give it a try. He mastered it almost instantly. Then he tried throat singing, a traditional form of performing ‘kai’. Again, he was a success. "You know, when I tried singing for the first time, I felt as if my chest had grown wider, as if I had wings sprawling behind my back," he says. "Just look at the view," says Kergilov. His cottage in the Chemal region overlooks the turquoise waters of the Katun River. “I have wanted to live near the Katun all my life,” he says. “There was nothing but mountains in the place where I grew up. Once I climbed one of them and could make out the Katun in the distance. It was like seeing God." Kergilov built the house himself and decorated it with his own paintings. In the yard he set up an ail, a traditional Altai hexagonal house. He installed a pull-up bar to keep fit and a carpenter's bench packed with woodworking equipment to make topshurs. "My instruments are well-known and I have a year-long queue of customers,” he says. “Most of them are throat singers from Altai, Tuva and Khakassia . However, a couple of my topshurs are in Japan, too. It’s not a very lucrative business. Mostly I do it out of love for the art itself." This evening Kergilov is giving a concert. He will make more in two hours than a few days working on a topshur. To entertain his guests, the storyteller will change into a traditional Altai costume and sing a kai. A couple of times he might switch to Russian or even English, but the epic legends will be performed only in Altaian, which is the singer's mother tongue. His audience won't understand a word, but in this case feeling is more important than comprehending the meaning. Those who have heard of the mystical ambiance inherent to the Golden Mountains of Altai will feel it with all their hearts, as they listen to coarse throat singing and the silky sounds of a topshur. The grandson of a shaman woman, the head of the Kergil clan, a skilled woodcarver, blacksmith, artist, poet, storyteller, hunter and the salt of the Altaian earth – in his stage outfit Kergilov seems to be the embodiment of all the narrators whose voices were once heard by the shepherds' fires. They are the guides to the world of spirits that still live on here.